The previous images of the new Spider-Man costume from the upcoming reboot left me unmoved. The first official image, which showed Andrew Garfield standing pensively in a tattered Spider-man costume, felt anticlimactic aside from some subtle alterations. I found the additions of mechanical web shooters to be inconsequential. Then, behind-the-scenes photos from the films Los Angeles set threatened to turn my apathy toward the project into an active disdain for it. They showed a brightly colored Spidey engaged in some truly unspeakable poses with a random thug. All of the aforementioned had me convinced that this film would be an outright disaster. Now, as if the allay the fears of skeptics such as myself, Columbia Pictures has released what I consider to be the first truly “cool” image of the “new and improved” Web-Slinger (see above). Everything about this feels right, from the pose to the detailed texture of the fabric. The material looks flexible, like it allows for maximum maneuverability. This is the Spidey that I grew up on, cocked and ready for battle. Note how the texture on the mask looks similar to that of a basketball. The mechanical web-shooters can clearly be seen. To me it looks like spidey is wearing a couple of watches with the faces turned to the undersides of his wrists, but that’s a minor complaint. 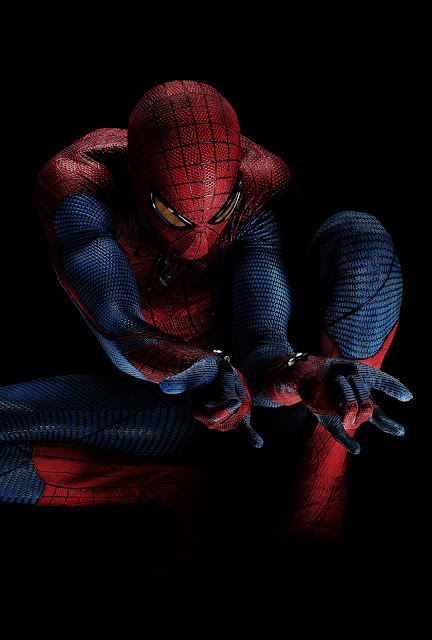 In even more positive news, Columbia Pictures announced that the official title of the film will be The Amazing Spider-Man. These recent developments give me hope that the finished product will not be embarrassment, and that director Marc Webb is indeed on the right track.